As residents up and down the eastern seaboard prepared for Hurricane Sandy to make landfall Sunday evening, President Obama pledged that federal agencies wouldn't let regulations get in the way of working effectively with state and local governments on response efforts. "My message to the governors, as well as to the mayors, is anything they need, we will be there," Obama said in an appearance at Federal Emergency Management Agency headquarters in Washington. "And we’re going to cut through red tape. We’re not going to get bogged down with a lot of rules. We want to make sure that we are anticipating and leaning forward into making sure that we’ve got the best possible response to what is going to be a big and messy system." Obama and White House officials met Sunday with FEMA Director Craig Fugate and representatives of the Defense and Energy departments and other federal agencies who will participate in the response to the hurricane. 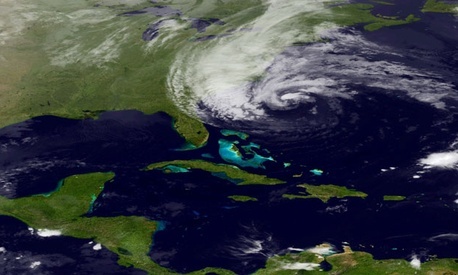 Obama characterized Sandy as a "serious and big storm." He emphasized that it's "important for us to respond big and respond fast as local information starts coming in." FEMA announced that Mobile Emergency Response Support personnel were in place or on the way to Delaware, the District of Columbia, New York, New Jersey, North Carolina and Pennsylvania to provide secure and non-secure voice, video, and information services, along with operations and logistics support to state response operations. The Defense Department announced this weekend that it had negotiated agreements with the governors of Maryland, New Hampshire, New York, New Jersey, Massachusetts and Rhode Island to appoint dual status commanders, who are autorized to direct both federal and state National Guard forces. The Pentagon's Northern Command has placed light and medium lift helicopters and rescue teams on 24 hour "prepare to deploy" status. Fugate said residents in the storm's path should heed the advice and warnings of local officials, and consult Ready.gov for information on how to prepare.